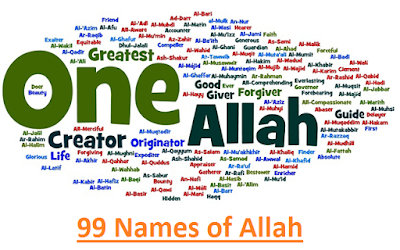 99 Names of Allah - Read al asmaul husna in english and arabic translation, you can also read the meanings of every names of Alloh below and download 99 names of Allah PDF format. Help me to share to media social like facebook, twitter, google plus. Bismillahirrohmanirrahim, this is beautiful names of Alloh. The One Who has an abundance of mercy for the believers and the blasphemers in this world and exclusively for the believers in the Hereafter. The One Who has an abundance of mercy for the believers. The One with absolute Dominion, and the One Whose Dominion is clear of imperfection. The One Who is pure from any imperfection and clear of children and adversaries. The One Who is clear of every imperfection. The One Who witnessed for Himself that no one is God but Him; and Who witnessed for His believers that they are truthful in their belief that no one is God but Him. The One for Whom nothing happens in His dominion except what He willed. The One Who is clear of the attributes of the creatures and of resembling them. The Creator Who has the Power to turn the entities from one state to another. The Subduer Who has the perfect Power and is not powerless over anything. The One Who makes the Sustenance reach His slaves. Sustenance is everything that benefits, whether halal or haram. The Knowledgeable; the One for Whom nothing is hidden from His Knowledge. The One Who lowers whomever He willed by His Destruction and raises whomever He willed by His Endowment. The One Who gives esteem to whomever He willed; hence there is no one to degrade him. The One Who degrades whomever He willed; hence there is no one to give him esteem. The One Who Hears all things that are heard by His Eternal Hearing without an ear, instrument, or organ. The One Who Sees all things that are seen by His eternal Sight without a pupil or any other instrument. He is the Ruler, and His judgment is His Word. The One Who is kind to His slaves and endows upon them. The One deserving the attributes of Exaltment, Glory, Extolement, and Purity from all imperfection. The One Who gives ample reward for a little obedience. The One Who is clear of the attributes of the creatures. The One Who is greater in status than everything. The One Who protects whatever and whomever He willed to protect. The One Who is clear of abjectness. The One from Whom nothing is absent. Hence its meaning is related to the attribute of Knowledge. The One Who is with perfect Power, High Status, Compassion, Generosity, and Kindness. The One Who resurrects His slaves after death for reward and/or punishment. The One from Whom nothing is absent. The One Who truly exists, i.e., the One Whose Existence is confirmed. The One with extreme Power which is un-interrupted, and Who does not get tired. The One Who knows the count of things. The One Who started the human being, that is, He created him. The One Who took out a living human from seminal fluid that does not have a soul. He quickens the dead by giving the souls back to the decayed bodies on the Resurrection Day and He makes the hearts alive by the light of knowledge. The One Who is attributed with a life that is unlike our life and is not that of a combination of soul, flesh, and blood. The Rich Who is never poor. Al­Wajd is Richness. The Master Who is relied upon in matters and is resorted to in one's needs. The One Who is attributed with Power. The One with the perfect Power from Whom nothing is withheld. The One Who puts things in their right places. He makes ahead whatever He wills and delays whatever He wills. The One above Whom nothing exists and underneath Whom nothing exists; hence He exists without a place. His Existence is obvious by proofs. He is clear of the delusions of bodily attributes. The One Who is clear of the attributes of the creation. The One Who is kind to His creatures, Who covered them with His sustenance and specified whomever He willed among them by His support, protection, and special mercy. The One Who grants repentance to whomever He willed among His creatures and accepts his repentance. The One with extreme Mercy. The Mercy of Allah is His Will to endow upon whomever He willed among His creatures. The One Who controls the dominion and gives dominion to whomever He willed. The One Who gathers the creatures on a day there is no doubt about, that is, the Day of Judgment. The Supporter Who protects and gives victory to His pious believers. The One Who makes harm reach to whomever He willed and benefit to whomever He willed. The One with Whose Guidance His believers were guided, and with Whose Guidance the living beings have been guided to what is beneficial for them and protected from what is harmful to them. The One for Whom the state of non-existence is impossible. 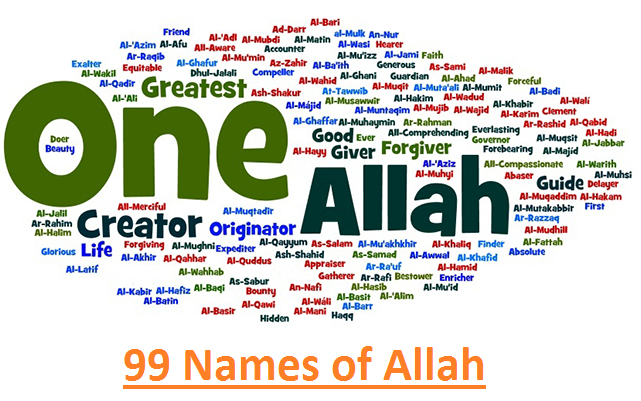 Watch and listen asmaul husna (99 names of Allah) in video below. Download and read offline wherever you want. Click "DOWNLOAD HERE" to begin download. "There is no one in the heavens and the earth but will come to the Beneficent Allah as a servant" (Quran, 19:93). "Al-Rahman al-Rahim" are two of the Attributes of Allah which remind people of His mercy, of the fact that His act of affecting goodness and rewards reach whomsoever He pleases, thus warding off evil from them. "Al-Rahman" and "al- Rahim" are two concurrent Attributes of His each conveying more meanings of mercy than the other. "Al-Rahman" is an Attribute specifically relevant to Allah; none besides Him can be called or referred to as such, whereas "al-rahim" can be applied to people: One may be described as "rahim," merciful or kind, but a human cannot be "rahman". It is an Attribute demonstrating that mercy can be possible only through Him. It means "the One Who grants mercy beyond which there is no other mercy at all and the like of which does not at all exist." Though derived from mercy, "al-Rahman" is both a noun and an adjective. Neither contradicts the other. It is commonly known that mercy means: one's desire or power of will to bring goodness to one who is much less than him in status. "Inform My servants that I am the Forgiving, the Merciful" (Quran, 15:49). "Al-Rahim" is derived from "rahmah," mercy or compassion. "Rahmah" implies the salvation of those who receive it from harm and loss, and their being blessed with guidance, forgiveness and sound conviction. Al-Rahim, i.e. the One Who grants rahmah, is a superlative. It is the highest derivative form of rahmah. Allah has said, "He it is Who sends His blessings on you, and (so do) His angels, so that He may bring you out of utter darkness into the light, and He is Merciful to the believers" (Quran, 33:43). Al-Rahim is the One Who bestows countless blessings. Some say that this word is derived from "Rahim," and we have already come to know that the root word for it is "rahmah," that is, favors from Allah and blessings; surely His blessings cannot be counted, nor can they ever be exhausted. The Messenger of Allah has said, "One who has no compassion towards people is deprived from Allah's Compassion." He has also said, "One who does not respect the seniors among us, nor shows compassion towards our young, nor safeguards the rights of the scholars among us, is surely none of us." Compassion among the servants of Allah is a sure path to achieving the mercy of Allah. The Messenger of Allah has said, "Be merciful unto those on earth so that those in the heavens may be merciful unto you." "So exalted be Allah, the True King; no god is there but He, the Lord of the honorable dominion" (Quran, 23:116). "Al-Malik" conveys the meaning of "One Who is free, by virtue of His Own merits and characteristics; from depending on anything in existence, while everything in existence depends on Him." Nothing in existence can do without Him, whereas everything that exists derives its existence from Him or because of Him. Everything/everyone is His. Master of the Day of Judgment. (1:4) and another method of recitation: Melik, King of the Day of Judgment. The Almighty has described Himself as being "Malikul-Mulk," the Owner of everything, of the whole domain, saying, "Say: O Allah, Master of the Kingdom!" (Quran, 3:26), and "Master of the Day of Judgment" (Quran, 1:4), which is one of the first verses of the Holy Quran. A land's owner is its "malik," one legally bound to obey the king, the "malik," with regard to land-related laws issued by the latter, whereas the opposite is not possible. Among the Attributes of Allah Almighty, the word "al-Malik" has occurred independently, whereas the word "Malik" is always added to something else, such as "Maliki yawmid-Deen," Master of the Day of Judgment; therefore, the first Attribute has to be more revered. "Whatever is in the heavens and whatever is in the earth declares the glory of Allah, the King, the Holy, the Mighty, the Wise." (Quran, 62:01). He has also said, "Whatever in the heavens and in the earth declares the glory of Allah, the King, the Holy" (62:1). Al-Qudds is the One Who is above need and Whose Attributes are above being deficient. He is the One Who purifies the souls against sinning, Who takes the wicked by their forelocks, Who is above being limited to space or time. The Messenger of Allah once sent one of his companions to teach Islam to a group of new converts and to lead them in congregational prayers. That companion used not to recite any chapter of the Holy Quran (besides, of course, the Fatiha) other than Surat al-Tawhid (or al-Ikhlas), so those believers went back once to the Prophet and told him about it. The Prophet said to them, "Go back and ask him why he does so." Upon asking him, the companion answered them by saying, "... because it contains the Attribute of al-Rahman, and this is why I love to recite it so often!" When they told the Prophet this answer, he said to them, "Go back and tell him that the Praised and Glorified One loves him too." Ibn `Abbas spent a night once with his cousin the Messenger of Allah. When the Messenger of Allah woke up and stood up on his bed, he raised his head towards the heavens and thrice repeated the following statement: "Subhanal Malik al- Qudds!" (Glory to the King, the Holy!) Then he recited the last verses of Surat Ali-`Imran starting with the verse: "Surely in the creation of the heavens and the earth..., etc."